Recto, top row: Two details of Ascension of Virgin; inscription: Perugino Bologna. Second row: adoration of Magi; inscription: Alfonso Lombardo Bologna. Third row: birth of Virgin. Two representations referring ro S. Dominic; inscription: Alfonso Lombardo S. Domenico in Bologna. 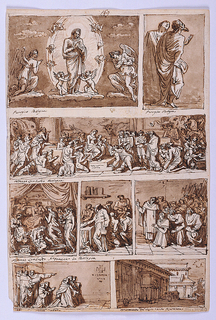 Bottom row: presentation to Dominicans; inscription: Alfonzo lombardo. Square with two sarcophagi bordered by two churches; inscription: monumento del cinque cento Ravenna. Verso, top: corner of Renaissance palace with view of street; inscription: monumento del/cinque cento/Bologna. Bottom left: view of coffered arch and coffer; inscription: monumento cinque cento/Bologna. Part of narrow Renaissance house with short view of street.